Micromax has launched their latest in Tab series which is Canvas Tab P666 which comes with an 8 inch screen and is powered by a 1.2 GHz Intel Atom processor and comes with built in 3G support. It is being priced at Rs. 10,999 in India. The Tablet device which is named as Tab P666 comes with a Intel Atom Z2520 Dual core processor which clocks at 1.2 GHz and sports 1GB of RAM and has 8GB of internal storage out of which 3.99 GB is available for user, internal memory can be expanded to 32GB using microSD card slot. It has a 8 inch WXGA Display with 1200 x 800 pixels resolution and having 16M colours. The device comes with 5MP rear or primary camera which records 1080p videos and does not have LED flash and 2MP front facing camera. Along with this all the basic features like light sensor, accelerometer and proximity sensors and comes with single SIM slot along with 3G, 2G, Wi-Fi, Bluetooth and GPS support. The device is powered by a 4400 mAh battery which gives 15 hours on a single charge. The device is priced at Rs. 10,999 which is a decent enough price for the features at offer and the battery life of the device is also decent enough. With the recent news about Micromax becoming a partner with CyanogenMod we have to wait and see if all the devices from Micromax will be running on CyanogenMod or just a select group of devices specifically launched with CyanogenMod support will be seen just like the Android One devices launched by Micromax and other companies. 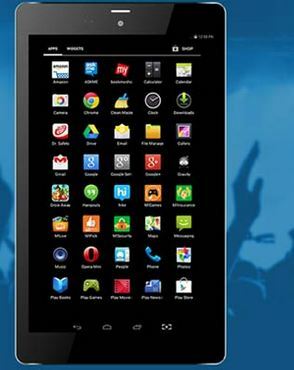 And there are many tablet devices from other companies which are in the similar price range but with better features. And there are many complains from Micromax phone users that updates are not frequently sent to their devices by Micromax. This might change after CyanogenMod link up, lets wait and see.